Record all index data including titles, parents, breeder and owner. Record medical history and genetic information. Fantastic search function for selecting dog data. 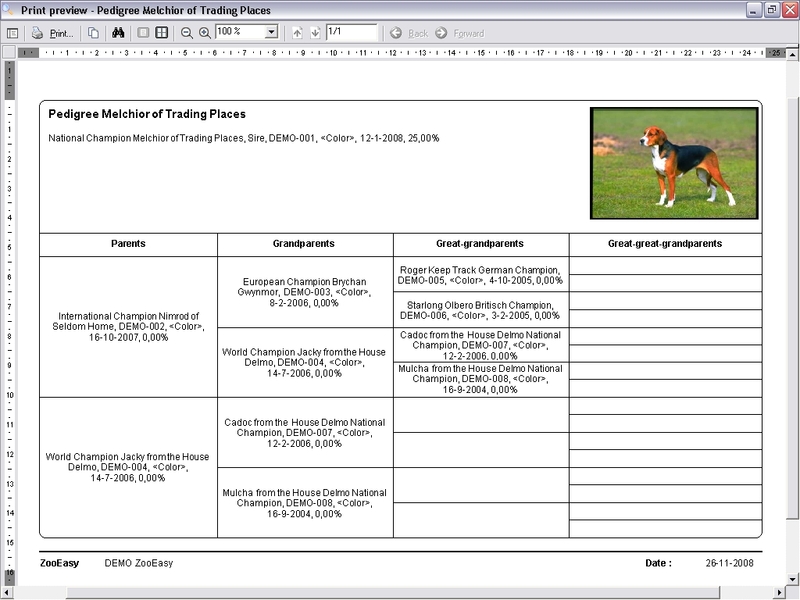 Print up to 5 generations in one pedigree including picture and your own watermark or logo. Quickly add new records from within the pedigree. Follow bloodlines unlimitedly and see the information displayed in pedigrees. Record all visits to the vet including diagnoses. 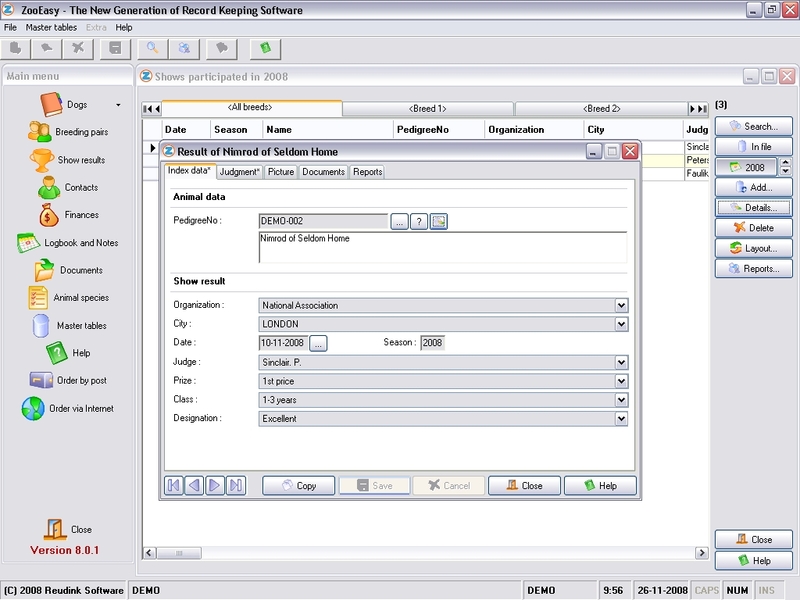 Easily change an incorrect pedigree number. Quickly see how dogs are related. Brilliant default check to prevent double pedigree numbers. Easily record additional details such as medical checks on elbow or eye deficiencies. Easily distinguish between own-bred and other dogs. Easily enter a digital picture. Print the index card for each dog including all relevant details. Record foreign pedigree, chip and tattoo numbers. Compose trial breeding pairs based on relationship percentages. 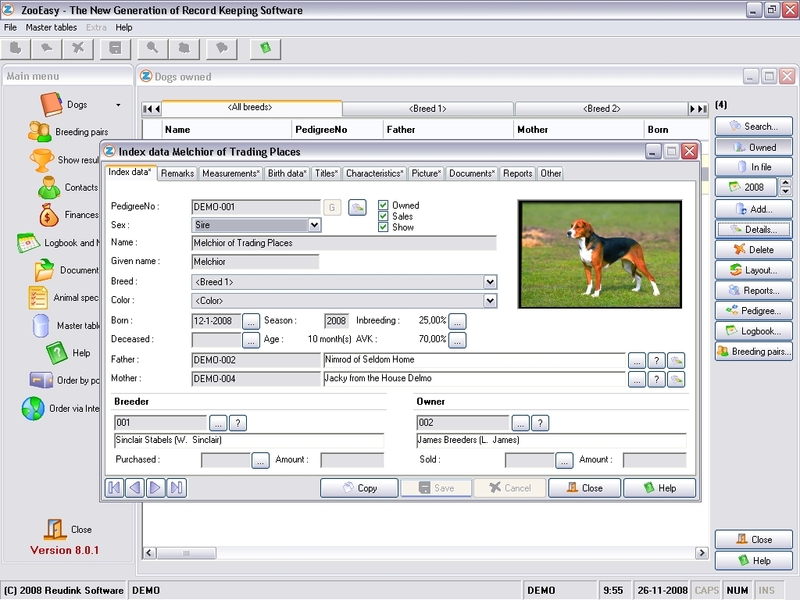 Record dogs with or even without a pedigree number. Common ancestors are marked in the pedigree. This very quickly enables you to see which dogs cause inbreeding. Store the weight scheme per dog. Request a graph with the weight development per dog. Create a relationship matrix which shows how closely dogs are related. 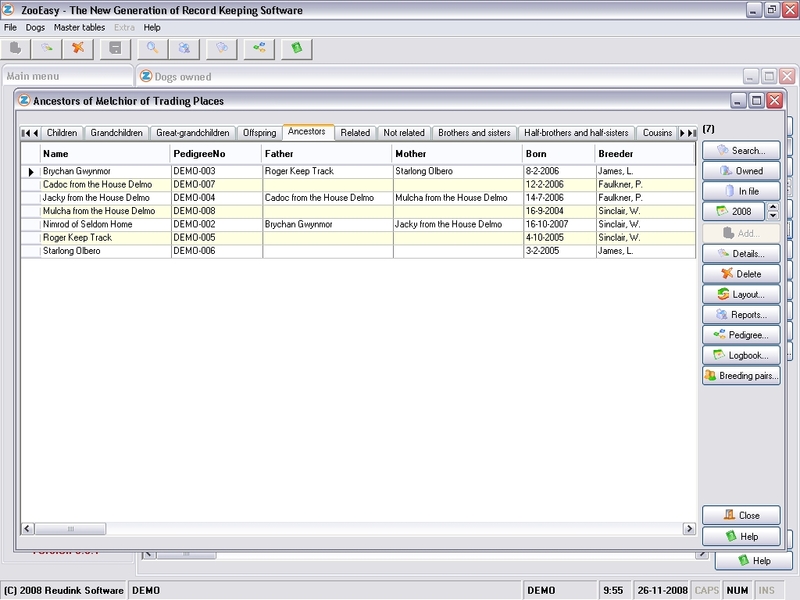 Quickly add dogs from within the pedigree in order to complete incomplete pedigrees. Enter multiple measurement values of body characteristics such as ear length. Categories can be added easily. Calculate the number of breeding pairs for each dog. Easily record puppy details and characteristics such as behavior. Compose trial pairs based on relationship percentages. 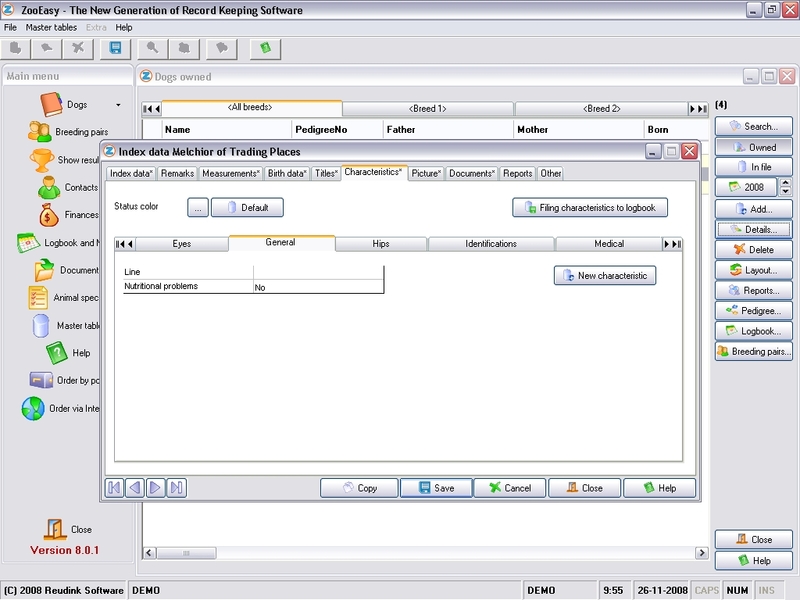 Sophisticated search function for selecting breeding pair data. 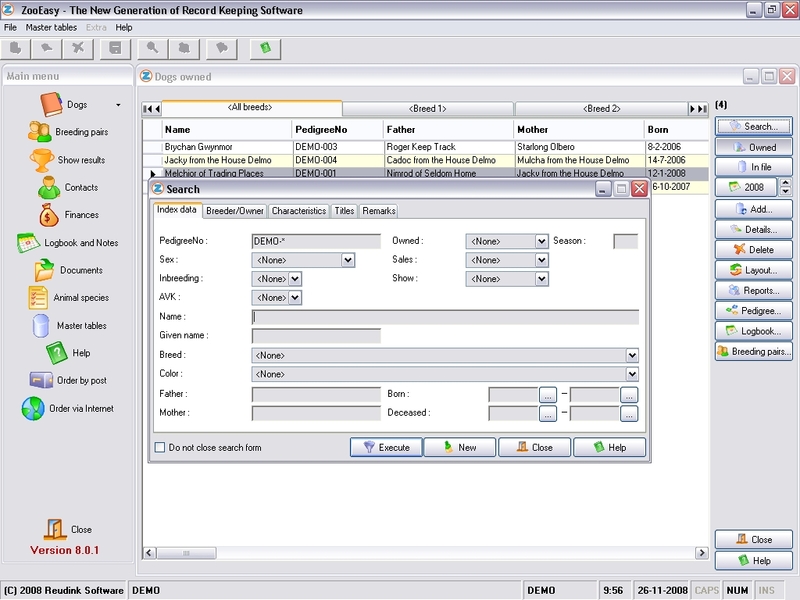 Print a report of breeding pairs. Export the complete pedigree of a certain dog to a file and/or send it by E-mail. Convenient to provide other ZooEasy users with a complete pedigree when selling a dog. Fully record the judge's report, including remarks. 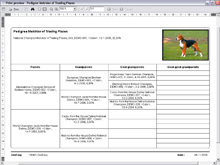 Produce an index card for each dog, including or excluding medical history, remarks or details. Create lists of dogs on the basis of medical diagnosis, sorted by name, pedigree number or color. 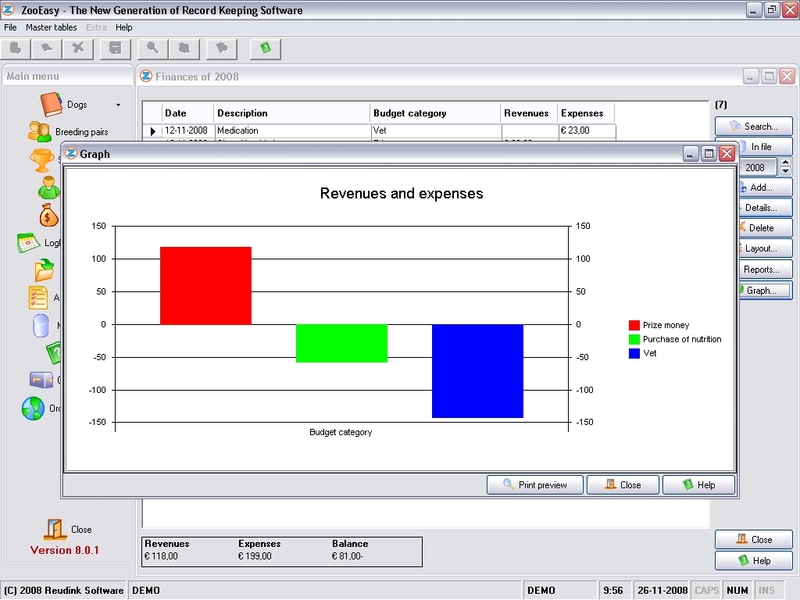 Optional tailor-made reports for dog breeding clubs and associations (request a free quotation). The entry is checked while recording the details.